Hand sharpening was quite easy, but I noticed something interesting in the shavings-- the neon finish was separating from the wood of the pencil. 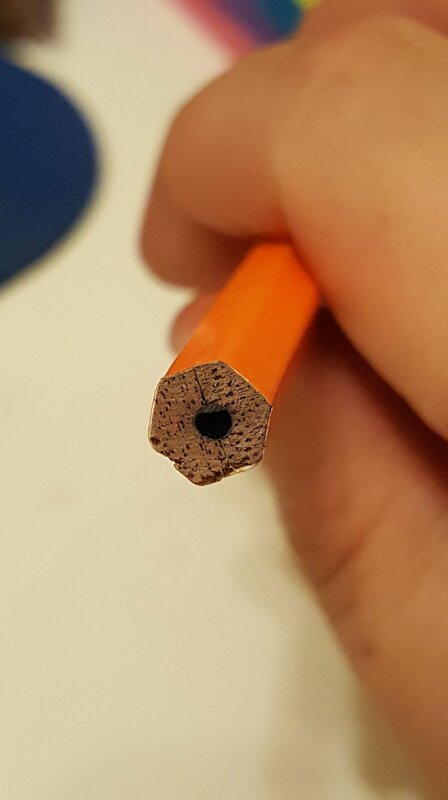 I do not have pictures, but the Nataraj pencils do not do this at all, so again I am left wondering if these are factory seconds or a few steps have been skipped in the manufacturing process to cut costs. Aesthetics aside, when it comes to writing, there is a noticeable difference. I found that the Casemate pencil wrote a lot smoother than the Nataraj but laid down slightly lighter marks. This observation does not seem to fit the experience, but I prefer this-- some may not. I wonder if this is due to the fact that there might be some additives to the graphite in the Casemate pencil to cheapen the cost. Both pencils were a delight to write with, but I found myself preferring the Casemate. As you can see from the bottom of the writing sample, both pencils have HORRIBLE erasers. Do not use them. You can, but don't expect good results. They shading erased beautifully, but trying to erase text is an exercise in futility. At 97 cents a 12 pack, the Casemate pencils are a steal, but remember HEXAGONAL only. If you are interested in Nataraj Neons, head over to Caroline where one can pick up a dozen for about three and a half dollars. The Apsara Stenographer's Pencil is manufactured by the Hindustan Pencil Company in India. Hindustan also manufactures the better-known Nataraj brand as well. I was a bit curious as to why this pencil was marketed as a "stenographer's pencil" since it seemed like an ordinary pencil to me. With a round barrel and no ferrule, the Apsara is a very light pencil. The finish on the pencil is a nice glossy turquoise with a white stripe at the top where the ferrule would naturally start and gold foil stamping. After sharpening the Apsara, I did not notice any smell at all so it is clear this pencil is not made of cedar. I presume it is crafted from recycled wood of some sort. When writing with this pencil it was very light in my hand and I found myself without the hand cramping that I am used to. This factor, coupled with its strong graphite, explained why this is denoted as a stenographer's pencil. I experienced no lead breakage ever and the smoothness of the graphite was on point for a pencil that cost 40 cents. Even writing on super toothy card stock was a pleasant experience and the graphite barely smeared. Erasing the pencil was also a breeze and took very little effort.